By Miriam Valverde on Thursday, May 17th, 2018 at 11:14 a.m.
President Donald Trump has fueled criticism from lawmakers and immigrant rights advocates after saying that some people coming into the United States are "animals." 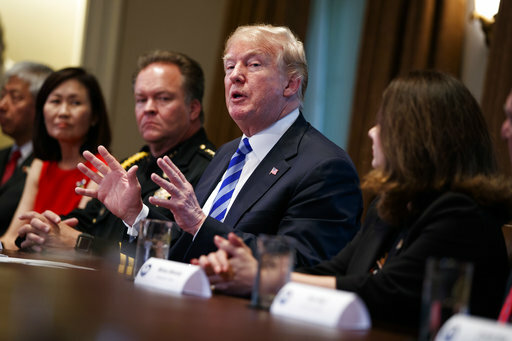 Trump’s remarks came during a May 16 immigration roundtable discussion that touched on so-called sanctuary cities, MS-13 gang members, the federal "catch and release" practice, and policies in California related to the detention of immigrants. Participants included cabinet members, California sheriffs and other elected officials. But it was Trump’s "animals" comment that sparked the most attention. "Immigrants are not ‘animals.’ The president’s statement was deeply offensive and racist. Immigrants are our family and friends, and they make significant contributions to our country," tweeted Sen. Dianne Feinstein, a Democrat from California. Immigrants are not “animals.” The president’s statement was deeply offensive and racist. Immigrants are our family and friends and they make significant contributions to our country. However, some have pointed out that Trump was not calling all immigrants "animals," and rather made that comment in reference to MS-13 gang members, known for committing brutal crimes. Trump did not specifically mention MS-13 in the same sentence, but his comment came after a California sheriff said U.S. Immigration and Customs Enforcement cannot use her office’s databases "to find the bad guys" and that "there could be an MS-13 gang member" she knows about, but can’t tell the federal agency. Here’s the exchange for full context. Margaret Mims, Fresno County Sheriff: "Thank you, Mr. President. You know, sheriffs in California are now in an untenable position when it comes to trying to figure out — now, we have state law, we have federal laws, and here we are stuck in the middle. Sheriffs, especially, because most of us run our county jails. "When there became a legal challenge to the 48-hour holds for ICE, it was very frustrating for us. So what I did is I invited ICE to put their officers in my jails so they're able to do their work. We didn't have the staffing to be able to help figure out who they wanted to talk to or didn't. I said, come on in, work with our people to keep our community safe. Two weeks later, Mr. President, Kate Steinle was murdered. "Now, I wasn't the only sheriff to do that. Sheriff Youngblood did, Sheriff Christianson. And it was perfect — because we didn't have to take our time, with our staff, to do, to do anything. ICE was in there doing their work in a safe, controlled, environment. And then, the initiatives started happening -- the TRUST Act, the TRUTH Act, and finally, SB 54, the Values Act. And that is causing us all kinds of turmoil. "So here we are, stuck in the middle, trying to decide. We have federal law, we have state law. And that's why I welcomed Attorney General Sessions's lawsuit, because that will provide us the clarity that we need and direction that we need. What do we do? Because here we are. The dumbest laws, as I said before, the dumbest laws on immigration in the world. So we're going to take care of it, Margaret. We'll get it done." "Immigrants are not ‘animals.’ The president’s statement was deeply offensive and racist."